Howard Morphy is Director of the Centre for Cross-Cultural Research at the Australian National University and Honorary Curator of the Pitt Rivers Museum in Oxford. 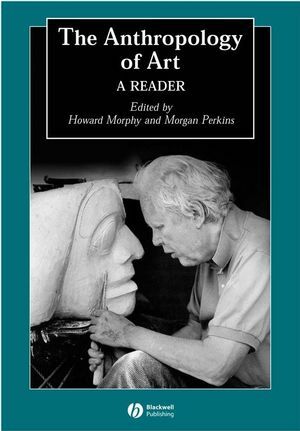 Introduction: The Anthropology of Art: A Reflection on Its History and Contemporary Practice: Howard Morphy and Morgan Perkins. Part I: Framing the Discipline:. 1. Primitive Art: Franz Boas. 2. Split Representation in the Art of Asia and America: Claude Lévi-Strauss. 3. Tribes and Forms in African Art: William Fagg. 4. Style, Grace, and Information in Primitive Art: Gregory Bateson. 5. Tikopea Art and Society: Raymond Firth. 6. The Abelam Artist: Anthony Forge. Part II: Primitivism and Art/Artifact:. 7. Introduction. In “Primitivism” in 20th Century Art: Affinity of the Tribal and the Modern: William Rubin. 8. “Primitivism” in 20th Century Art: Arthur C. Danto. 9. Histories of the Tribal and the Modern: James Clifford. 10. A Case in Point: Sally Price. 11. Oriental Antiquities/Far Eastern: Craig Clunas. 12. Introduction. In ART/Artifact: Susan Vogel. 13. Vogel's Net: Traps as Artworks and Artworks as Traps: Alfred Gell. Part III: Aesthetics Across Cultures:. 14. Yoruba Artistic Criticism: Robert Farris Thompson. 15. Style in Technology: Some Early Thoughts: Heather Lechtman. 16. “Marvels of Everyday Vision”: The Anthropology of Aesthetics and the Cattle-Keeping Nilotes: Jeremy Coote. 17. From Dull to Brilliant: The Aesthetics of Spiritual Power Among the Yolngu: Howard Morphy. Part IV: Form, Style and Meaning:. 18. Visual Categories: An Approach to the Study of Representational Systems: Nancy D. Munn. 19. Structural Patterning in Kwakiutl Art and Ritual: Abraham Rosman and Paula G. Rubel. 20. Sacred Art and Spiritual Power: An Analysis of Tlingit Shaman’s Masks: Aldona Jonaitis. 21. To Weave and Sing: Art, Symbol, and Narrative in the South American Rain Forest: David M. Guss. 22. Modernity and the “Graphicalization” of Meaning: New Guinea Highland Shield Design in Historical Perspective: Michael O’Hanlon. 23. Introduction. In Ethnic and Tourist Arts: Cultural Expressions of the Fourth World: Nelson H. H. Graburn. 24. The Collecting and Display of Souvenir Arts: Authenticity and the “Strictly Commercial”: Ruth B. Phillips. 25. The Art of the Trade: The Creation of Value and Authenticity in the African Art Market: Christopher B. Steiner. 26. A Second Reflection: Presence and Opposition in Contemporary Maori Art: Nicholas Thomas. 27. Representing Culture: The Production of Discourse(s) for Aboriginal Acrylic Paintings: Fred Myers. 28. Aesthetics and Iconography: An Artists Approach: Gordon Bennett. 29. Kinds of Knowing: Charlotte Townsend-Gault. 30. CEW ETE HAW I TIH: The Bird That Carries Language Back to Another: Jolene Rickard. "A unique and timely manual that serves to connect the student with the creative impulse of man." A single-volume overview of the essential theoretical debates in the anthropology of art, ideal for those who are new to the subject. Draws together significant work in the field from the second half of the twentieth century.